It's the first week of Show Me Your Summer Sparkles! YAY FOR SPARKLES! To start, I did two coats of UV Meant to Be, and let it dry completely. Then, I added the clouds, using a medium-sized dotting tool and White Tips. While that was drying, I used a thin nail art brush to get started on the ice cream cone. I started with the cone, and then used the white Stripe Rite for the ice cream. While that was drying, I used the same thin nail art brush to make the ice cream bar, with That's Shore Bright, and added the little stick beneath. Then it was back to the ice cream cone for another coat of white Stripe Rite and You Don't Know Jacques. I added another coat of That's Shore Bright to the bar and let them both dry. For the ice cream cone's sparkle, I used one coat of The Outer Edge (which wasn't quite as sparkly as I'd hoped) and for the bar, one coat of Explosion of Fun. When that was dry, I outlined each design with black Stripe Rite, and then used Glisten and Glow's HK Girl quick dry topcoat to seal it all together. If I hadn't decided to outline the ice cream cone and bar, this mani would've been a breeze. But with the outlining, it was kind of a nightmare. I have pretty steady hands, but those curved lines, guys. THEY WERE WERE SO FREAKING HARD. So if you're thinking this is a design you'd like to try, keep in mind that outlining may be for suckers. Haha! Aside from that, I looooooove how it turned out. In fact, a week later, I'm still rocking them! That Glisten and Glow top coat is the best, nail peeps. If you haven't tried it, I highly recommend that you do. It dries super fast and doesn't shrink the polish like some other top coats (*cough*SecheVite*cough*). And for you Americans, I hope you have an amazing 4th of July! How fun is that?! It's so perfect for summer. I can't imagine free handing that (straight lines and curves...ick). Well done! 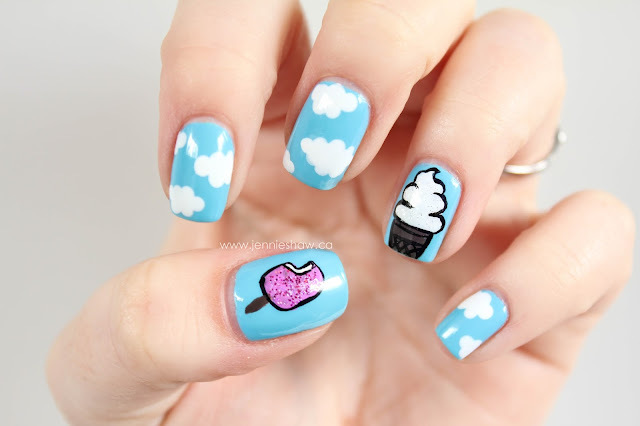 I love clouds & ice cream. So cute. Love the icecream on your name. I'm rocking 4th of July nails this week. I love it! 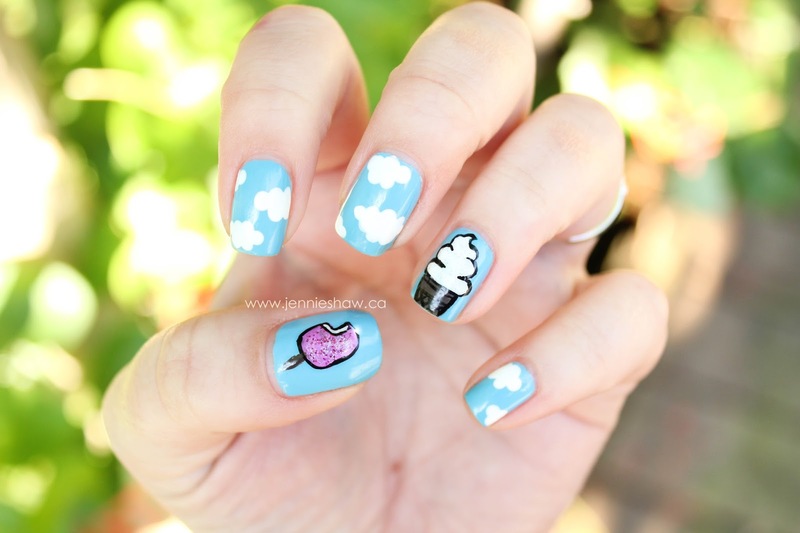 The ice cream cone & sandwich are soooo cute. I can imagine they were quite hard to outline, but totally worth the hassle.